With the new bk3000 and its TriCore Architecture, you’ll see three times the information in every image*. BK Medical has developed a new way to optimise ultrasound image formation using MultiChannel Synthesis to deliver Ultra High Resolution Imaging and Doppler. The technology fuses channel information at every position and depth to dramatically reduce noise and artifacts, while increasing detail and contrast resolution. Doppler spatial and temporal resolution advances define haemodynamics in small vessels. With the bk3000 you will routinely see anatomy and micro-vascularisation not seen with conventional ultrasound. Visualise subtle tissue contrast, more information at depth and see exceptional detail in moving structures with increased frame rates. Adopting the gaming industry’s best streaming graphics processing and architecture, the bk3000 is powerful and power efficient. The result is Accelerated System Control so you see more, faster. 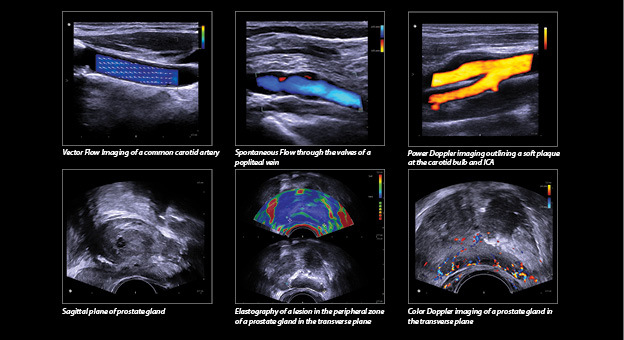 Triplex imaging is more responsive than ever, displaying 2D, color and spectral Doppler at unsurpassed frame rates. TriCore Architecture uses Graphic Processing Units, or GPUs, the latest advance in computing power to dramatically increase performance. The result is an ultrasound platform with an accelerated beam forming and computing pipeline for quick, confident assessments of anatomy and physiology during exams. Unparalleled performance in a sleek system that is designed for easy mobility in tight spaces, the bk3000 has five wheels for excellent stability and a small footprint. The system is completely adjustable to suit the preferences of clinicians, whether standing or sitting. Its monitor swivels and allows multiple adjustments for individual preferences. The bk3000’s intuitive user interface is designed for easy control with all major mode controls easily accessible. The keyboard is sealed, making it very easy to clean. For further information please visit bk Ultrasound or contact Scanmedics on +612 9882 2088.